Smart Bandage Technology: Design and Application is a guide to the integration of sensors and electronic systems into bandages for the application of wound management. Davis provides a comprehensive guide to the design and development of functional material for wound management for engineers of all levels possessing core knowledge in chemistry, biochemistry, and materials science. Includes an introduction to the design of advanced wound care technologies for undergraduate engineers, as well as a coherent exploration of competing technologies suitable for postgraduate and postdoctoral researchers. 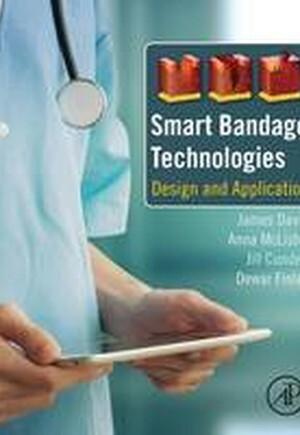 Each section provides a high level overview of the concepts and techniques involved in developing smart bandages, including their manufacturing, operation, and implementation, and also exposes and explores the most recent approaches to wound care in more detail. This book incorporates contextual boxes to provide a greater degree of detail to examples given and also includes an extensive bibliography for those seeking to research further on the various topics discussed.